Almost everyone recognizes Waldo, the world traveler with the jaunty striped knit cap and sweater. Your job is to figure out “where’s Waldo” when he is “hidden in plain sight” in cartoon pictures of large crowds at places like the zoo or the beach. Waldo has been around since 1987. But there’s another famous hidden-in-plain-sight character who has been around a lot longer—since at least the 1600s. 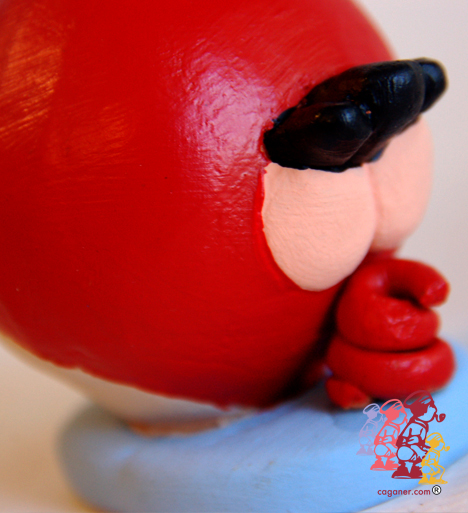 He is not very well-known outside of his native country, Spain. But with the advent of the Internet, his reputation is spreading. 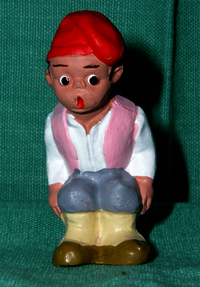 He is called “The Caganer,” and for most of his history, he has looked something like this: a little peasant with a red cap. 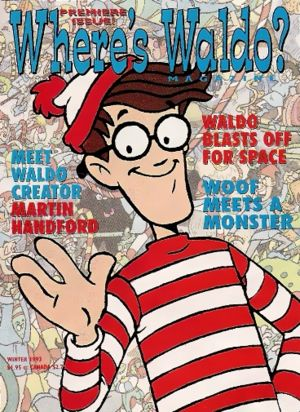 Unlike Waldo, looking for him is not a year around “game.” In Spain, he spends most of the year in obscurity. For his time in the spotlight is only during the Christmas season. 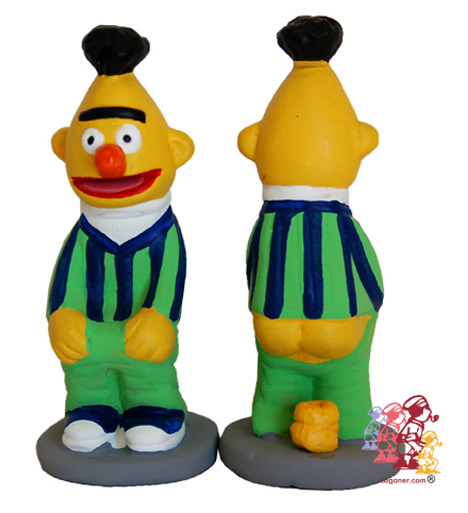 He is part of what surely must be the single creepiest “Christmas custom” in history. One of the popular customs in the United States in the weeks leading up to Christmas is setting up a “manger scene” depicting the Baby Jesus and his family and visitors—small figurines in homes, large statuary in public places. Some churches even sponsor “live nativity scenes” in which people play the part of Mary and Joseph, the Wise Men, and the Shepherds. Sometimes even live animals such as donkeys and camels are included. But in parts of northern Spain, particularly around Barcelona, you don’t just see just simple manger scenes, either in homes or public places. 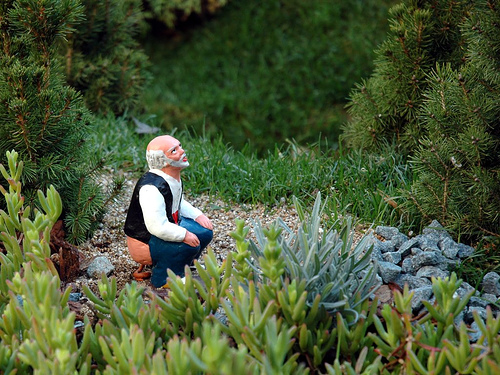 Just as in America, individual families may have small versions of this in their home, while towns and cities may have a central outdoor series of dioramas of large—sometimes even almost full-size—people, animals, and props. 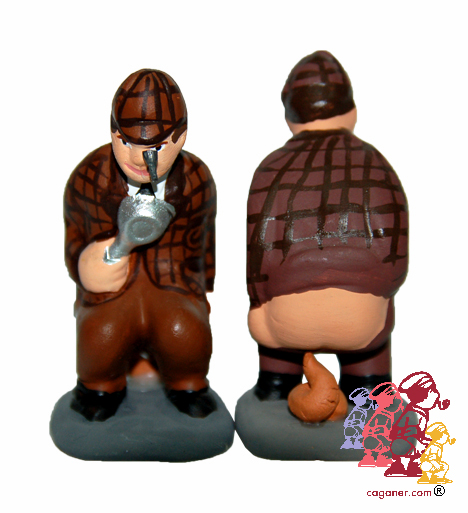 In Catalonia, as well as in some other parts of Spain, in Naples, and in Portugal, one of the highlights of the pessebre—particularly for children and teens—is “hunting for the caganer.” For somewhere in the elaborate scene he will be found, taking care of his business. And just WHAT is his “business”? 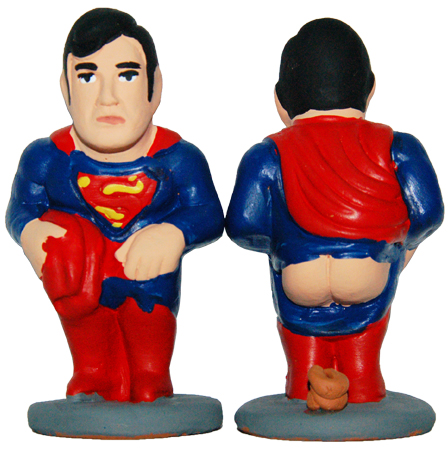 The name caganer, loosely translated into English, would be “the pooper”! 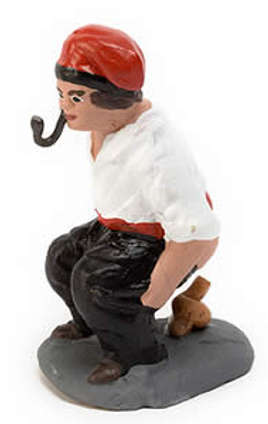 Yes, somewhere in every traditional pessebre is a statue of a person squatting down to “go to the bathroom.” You can tell that’s what he is doing, because below the “rear end” of the caganer statue is a little statue of poop. 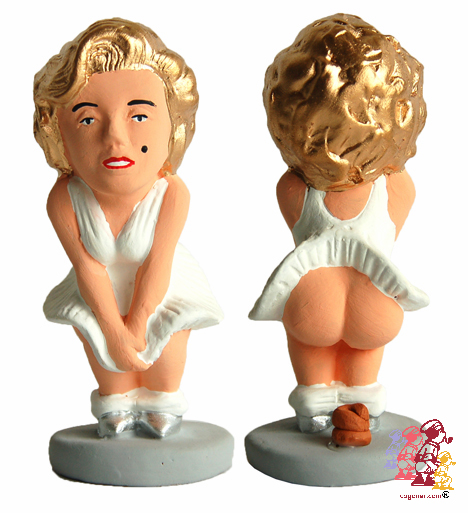 Back in the 1940s makers of caganer statues began “branching out” from the typical male peasant with the red cap. Branch out they have indeed! 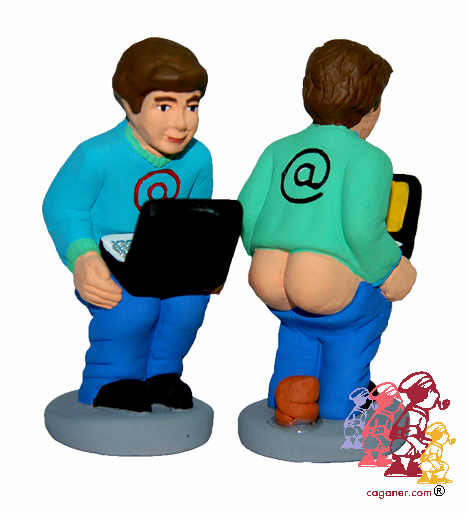 In recent decades you can get caganer figures that represent almost every class in society. No one is exempt from being caricatured. 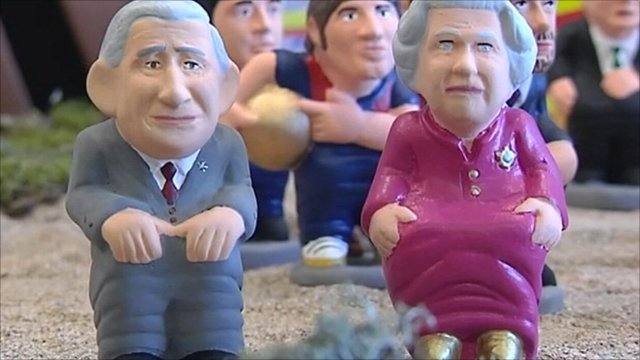 Want to put a squatting Queen Elizabeth and Prince Philip in your pessebre scene? No problemo. Want some younger royalty? 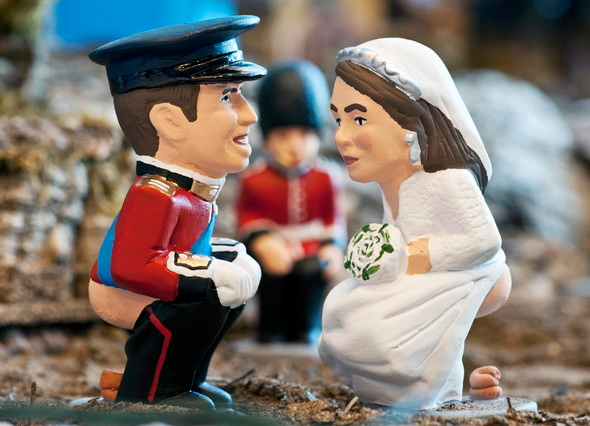 Back in 2011 that year’s happy couple, Prince William and his bride Kate, became available. You can have American politicians. The Dalai Lama and the Pope. 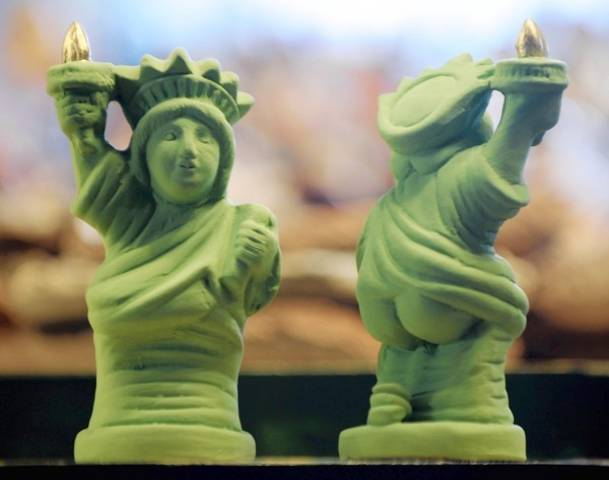 Even the Statue of Liberty isn’t exempt—but of course, she needs a green pile of poo. 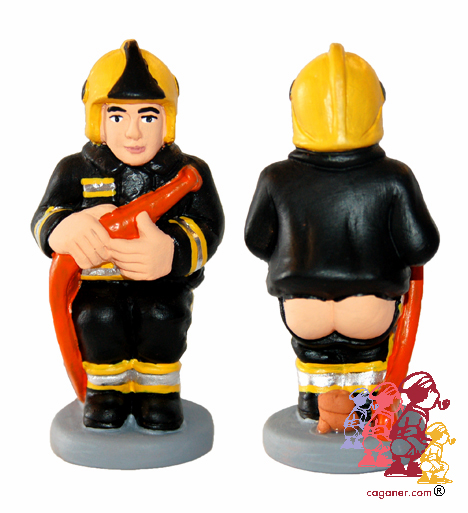 You can buy caganers directly from them, but if you happen to be in Spain at this time of year, you can go directly to a Caganer Kiosk…which are featured in particular at the annual Santa Llúcia Fair in Barcelona. Saint Lucy’s Day is December 13. 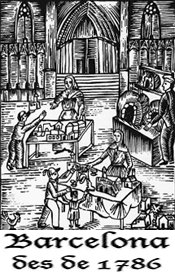 But every year since 1786, a fair has been held in her honor for much of the month of December, with the activities centering around a marketplace in the square in front of the Barcelona Cathedral. 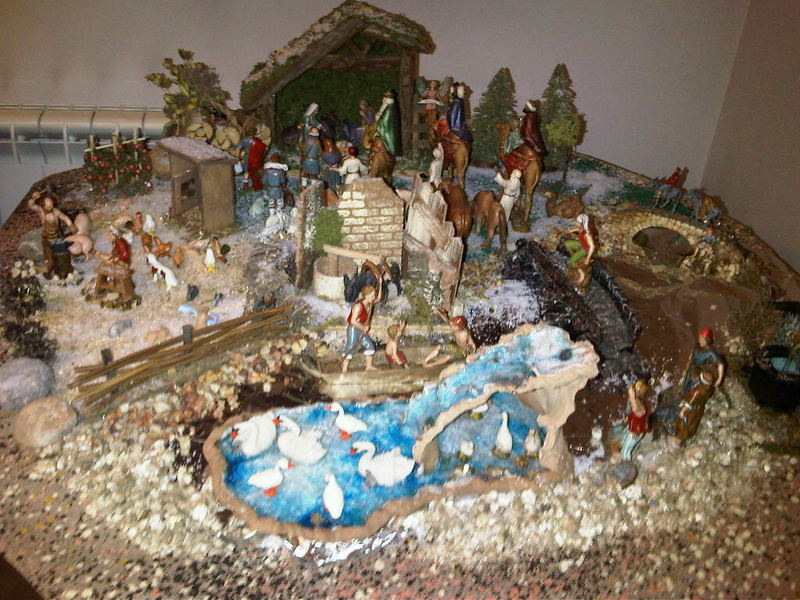 Since the earliest days, the market has particularly featured nativity scenes (pessebre) of all sizes, and the figurines (shepherds, wise men, camels, Mary, Joseph, the Baby Jesus and so on) and accessories necessary to complete them (such as materials to make landscaping.) You can buy whatever you need to make a pessebre small enough for a countertop, all the way up to life-sized figures to feature in a whole neighborhood. 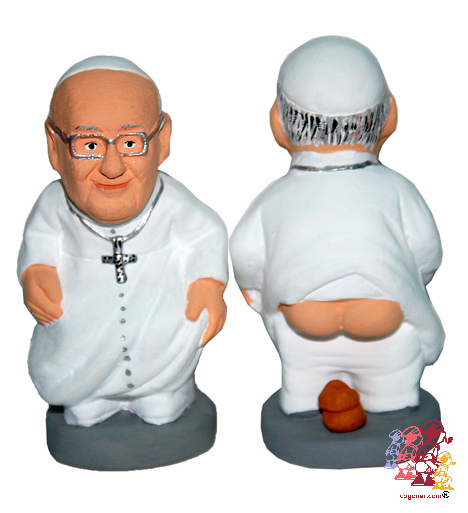 And since no pessebre would be complete without a caganer, you can buy caganers of every size too. It’s odd to think that some of the stars of the show in front of that astonishingly grandiose 14th century cathedral at this time of year are a bunch of little pooping people! What does this weird custom “mean”?? Nobody really knows. There are lots of guesses from sociologists and historians. Some suggest it started as some sort of religious rite related to ensuring “fertility of the soil” and prosperity of those erecting pessebres. Others suggest it was to insert a strong note of the “equality” of all mankind in the Christmas message. I figure maybe it just started as a medieval practical joke that got out of hand! But no one has ever been able to actually trace any “lineage” for the practice. 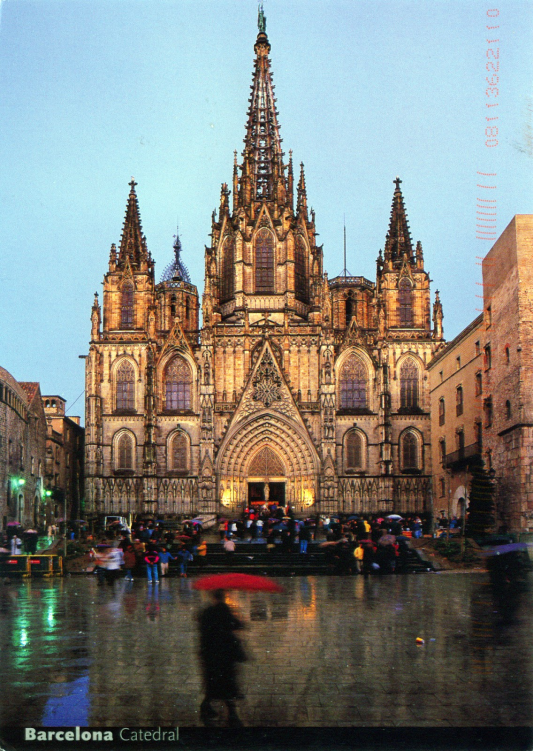 It just “IS.” And, as the Barcelona government found out, you interfere with people’s beloved customs at your own risk. 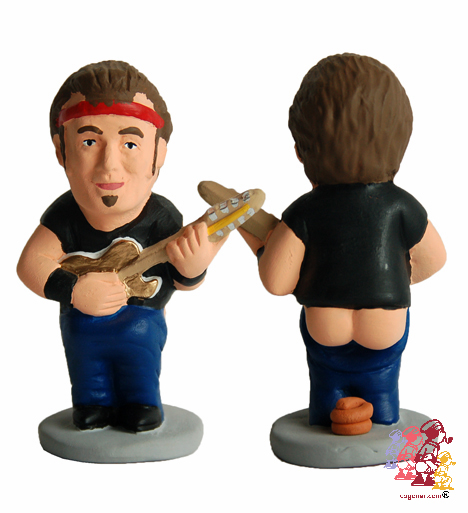 So I wonder what the top-selling caganer will be this year? Here is a selection of some of the contenders. There are “working people,” such as a fireman, a dentist, an executive, a computer geek, and even a midwife! 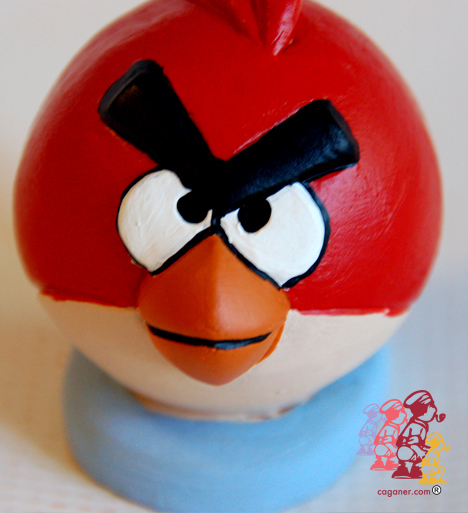 There are cartoon characters, from Dora the Explorer to Bert and Ernie, Snoopy…and an Angry Bird. And human fictional characters like Sherlock. 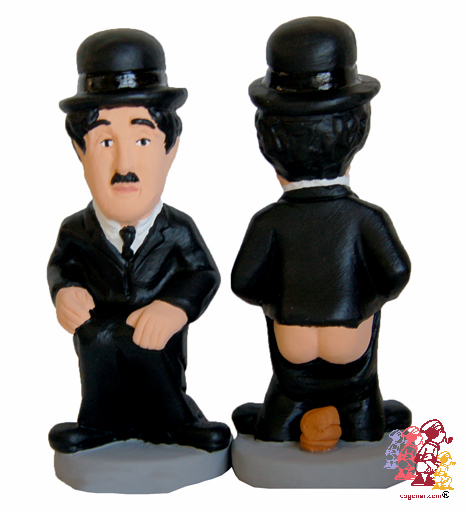 There are entertainers, from Bruce Springsteen to Charlie Chaplin and Marilyn. There’s even an Oscar to present to the winner! 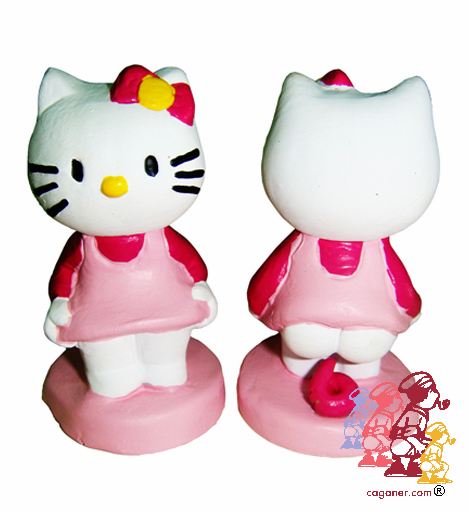 Complete, of course, with gold poop. 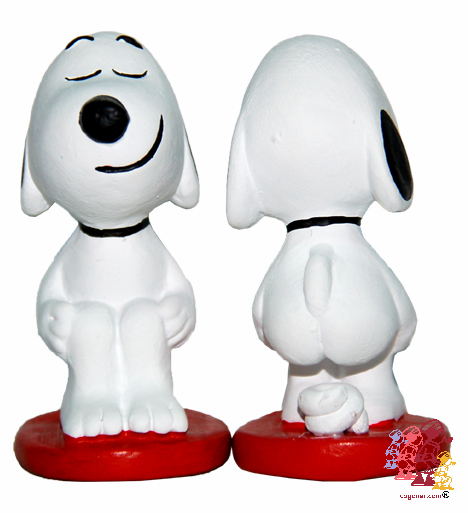 Yes, there are Donald Trump Caganers available this year, complete with red tie. 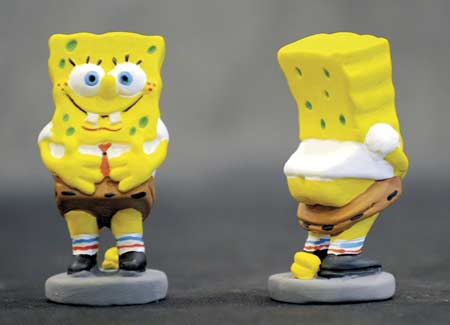 And, in fact, you can purchase a poopy face-off between Trump and Kim Jong Un. 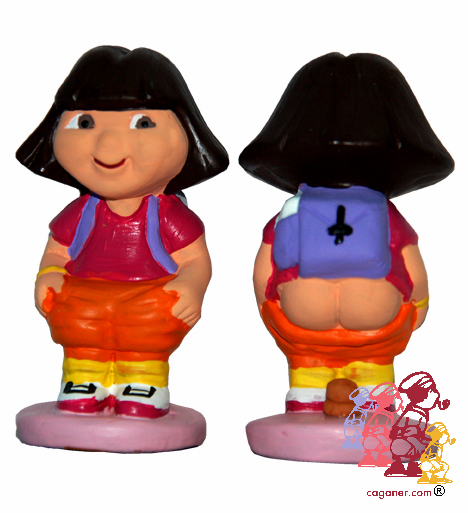 This entry was posted in strange and tagged caganer, pessebre. Bookmark the permalink.